BUCKTHORN, SEA (Hippophae rhamnoides). Hedging Plants, Trees, Shrubs and Conifers. 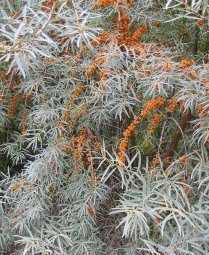 Slender silvery leaves and orange-yellow berries. Grown as a shrub.